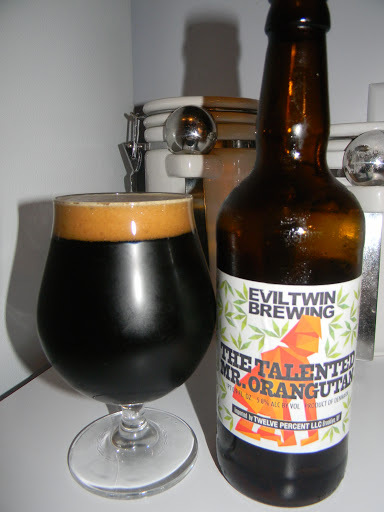 Review of Evil Twin The Talented Mr. Orangutan | Beer Apprentice - Craft Beer News, Reviews, Interviews and Info. Hi guys. For today’s craft beer review I’m going to be trying The Talented Mr. Orangutan produced by Evil Twin Brewing located in Valby, Denmark. This will be my first experience with anything from Evil Twin Brewing, so I’m hoping that it’s a pretty good brew. The website, eviltwin.dk, had this unique little description of the brew. He has proportionally longer arms than others, recognisable by his reddish-brown hair, among the most intelligent primates and uses a variety of really sophisticated tools. But what makes him so gifted and very sought after is his notorious ability to maintain deviously capable, deliver something unpredictable and always perform with a curious mind of a five year old. This brew has an ABV of 5.8% and it comes in a 16.9 oz. bottle. It poured an absolute black!!! No highlights whatsoever. It produced a tan/khaki colored head that was both smooth and creamy. It was adequately sized, however the retention time wasn’t all that great I didn’t think. The lacing was mostly average as well. The fragrance smelled great. Very nice coffee and espresso notes with light touches of chocolate. Easily defined toasted malts and breads too. It also had a very subtle orange citrus aroma that added a rather untypical twist. Even though the coffee aspects remained the most noticeable components it somehow had a balance with the citrus that had to be admired. The taste was more of the same. Roasted coffee bean with a smidgen of that orange citrus mixed in for good measure. Toasted bread crusts with some bittersweet dark chocolate. The bouquet and the taste really match up. Again, the coffee was still the start of the show however. The mouthfeel was medium to full bodied. Smooth, chewy, dry, slick and a touch chalky. The carbonation was good. No warmth was felt, however I wasn’t expecting much considering the somewhat low ABV. An outstanding amount of flavor was left covering the palate long after each sip. I’ll tell ya. I really liked this beer. The distinctive citrus character really helped to push this beer into uncharted territory. Well. uncharted for me anyway. I can’t say that I’ve ever had a Stout quite like this. The drinkability was great, yet I do believe that I would prefer it during cooler weather. If you like coffee Stouts, but want to stray from the norm I’d highly recommend giving the Evil Twin The Talented Mr. Orangutan a try if you can grab a bottle. Have you guys ever sampled this brew? What did you think? Feel free to leave a comment if you would like. I’d love to hear from you.